It is with heavy hearts that the family announces that on Thursday, July 10, 2014, Edna Elizabeth Murray passed away at the age of 90 years. Edna will be lovingly remembered by her family, David Arnott Thomson (Michelle, Shannon, Justin) and Bradley James Thomson (Leeann, Matthew, Heather); her sister in Law, Elizabeth Ruth Thomson; as well as her many friends. Edna is predeceased by her husband, Kenneth; and her brother, Jim “James” Thomson; her mother, Helen; and her father David Thomson; whom she cared for, for many years. Edna was born in Edmonton in 1924 and lived and cared for her father and brother for many years after the early passing of her mother in 1930. 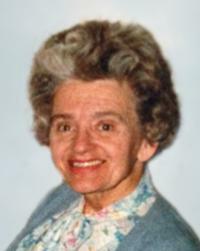 Edna was a graduate of the University of Alberta and taught for over 25 years in the Edmonton public school system. She married Ken Murray in 1976. Together they were active members of the Westmount Presbyterian Church. Edna was a 24 year member of Maple Leaf Rebekah Lodge #2, holding many offices, the highest being Noble Grand. She was an accomplished pianist and freely shared her musical gifts at many Rebekah meetings and functions. A funeral service for Edna will be held on Tuesday, July 15, 2014 at 1:00 pm at Westmount Presbyterian Church, 13820 109A Avenue, Edmonton. In memory of Edna donations are encouraged to the Canadian Save the Children Foundation or to the charity of one’s choice.